World number one Tiger Woods cruised to a three-shot victory in the Buick Open to claim his 69th PGA Tour title and his fourth of the year. Woods carded a three-under 69 for a 20-under total of 268, recovering after a first round 71 which left him in danger of missing the halfway cut. A second round 63 put him in contention before Saturday’s 65, which gave him a one-shot lead over Michael Letzig overnight. Letzig faded to a final round one-over 73 to slip quickly out of contention, with the main challenge coming from Roland Thatcher, who carded an eight-under 64. Woods, who is 36-1 in PGA Tour events where he leads going into the final round, took the lead for the final time with a birdie on the fourth and doubled it with a two at the short seventh. A brilliantly scrambled par after finding water on the 13th was followed by a birdie on 16 to extend his lead to three. Greg Chalmers (68) and John Senden (70) finished tied for second with Thatcher. 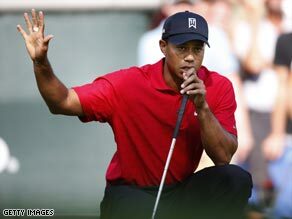 “You just had to be patient out there, but also stay very focused because there were certainly a lot of distractions,” Woods told the official PGA Tour Web site www.pgatour.com. South Korea’s Y.E. Yang (67) finished fifth at 16-under 272. Woods, who was claiming his third victory at Warwick Hills, was playing his first event since missing the cut at the British Open at Turnberry. He will play one more PGA Tour event before attempting to win his first major of the season in the PGA Championship at Hazeltine. In other tournament action, Fred Funk produced a superb performance to card a final round seven-under 65 to win the U.S. Seniors Open at Crooked Stick by six shots. Funk, who started the day with a one-shot lead over Greg Norman, finished 20-under overall with Joey Sindelaar in second place. Norman faded to a tie for fourth.